This is the first in a series devoted to the examination of some of the significant places, and the significance of place, in Canadian music history. One of the defining aspects of national music studies is the idea of how geographical boundaries affect and influence musical processes. Music is created and performed in a particular location, and although the notion of place becomes diluted by broadcasting and recording media, it is still an important factor even in those dimensions. I would like to express my thanks here to Alexandra Mosquin, a historian with the Historic Sites and Monuments Board of Canada, for providing information about musicians and music-related sites designated as being of national significance. The list she has provided will supply the subject matter for many installments in this series. Visit the HSMBC web site for further information, or to suggest an important musician or music-related site for the board�s consideration. The Leslieville house where the author of �The Maple Leaf Forever� lived more than a century ago is officially entering a new era this weekend. The Maple Cottage � an unassuming one-storey house on Laing Street south of Queen Street � will be celebrating its new life as a community centre this Sunday. One hundred and thirty-five years ago, the cottage�s then-owner Alexander Muir penned �The Maple Leaf Forever.� Until 1967, when �O, Canada� took the role, the song served as Canada�s unofficial national anthem. In point of fact, Muir never lived at Maple Cottage,2 and the legend connecting the maple tree on the property with his famous song, which was written in October 1867, rests on extremely shaky ground. According to the Toronto Historical Board, the cottage was built in 1873 and hence "can have no historical significance in relation to Alexander Muir or �The Maple Leaf Forever�. "3 Even the 1873 date seems questionable, as the property is not listed in Toronto city directories until 1891. It was owned by a variety of private individuals (but never by Alexander Muir) for nearly 100 years, before becoming vacant in the late 1980s.4 There were plans to tear Maple Cottage down to make way for a low-cost housing development, but when that project failed to materialize, a combination of political and community support resulted in over $300,000 being spent in renovations and improvements to the modest building. A further $128,000 has been set aside to landscape the property and furnish the cottage. There are plans to use part of the building to house a community archive for pictures and historical materials relating to the Leslieville area of Toronto. The cottage consists of a large meeting room, two offices, a kitchen, and a smaller room. Exactly when this particular tree came to be associated with "The Maple Leaf for Ever" is unclear. The legend about the song being inspired by one particular falling maple leaf received its definitive form in John Ross Robertson�s chapter on Alexander Muir in his Landmarks of Toronto.7 Robertson interviewed Muir�s widow in January 1909 and heard the story from her; he also quotes a still earlier version of the story, which George Leslie (after whom Leslieville is named) wrote for a local newspaper some years after the song was written.8 Both stories agree in essential details. Muir was looking for inspiration to write a poem for a contest, and was walking with Leslie. When a maple leaf landed on Leslie�s arm, he turned to Muir and told him to write a poem about the maple leaf. Leslie provides exact details as to the location: he was the postmaster of the Leslieville post office at the time, located at 1164 Queen Street East, and the two men met there and walked eastward for a short distance when the maple leaf fell. Laing Street is about two blocks east of the old Leslieville post office; the maple tree with the plaque is a further half block south of Queen Street. The 1930 Orange Lodge plaque seems to be the first association of the maple tree at 62 Laing Street with "The Maple Leaf for Ever." By 1930 that maple tree may well have been the only one left standing that was sufficiently old and near the location specified by Leslie to be a plausible candidate. 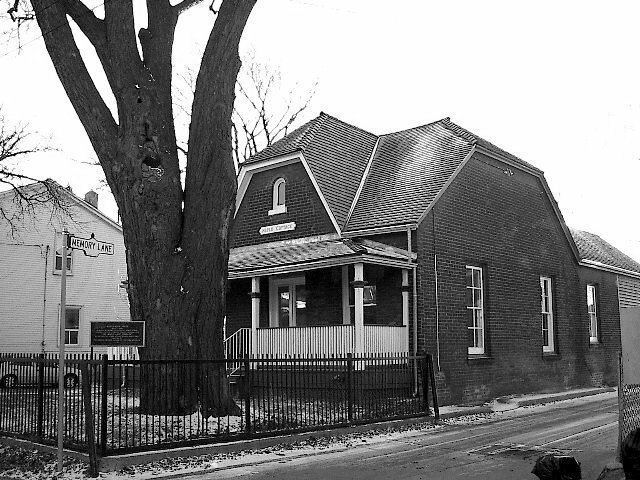 Other locations would have served the purpose of commemorating Muir better, or at least equally as well: the Leslieville public school, for instance, where he was principal at the time he wrote the song, or 60 Churchill Avenue, where he lived at the time of his death in 1906. Perhaps the Orange Lodge records, if they still exist, could shed light on why the maple tree at 62 Laing Street was chosen as the location for the commemorative plaque celebrating Muir and his nationalistic song. "The Maple Leaf for Ever" is easily incorporated into a nationalist narrative that tries to shape Canada into an "imagined community"11 that does not coincide with the reality of the country today. As Tim Stanley has pointed out, this narrative strategy (which historians call "grand narrative") is not only exclusionary and racist, but is often based on not particularly good history.12 That is certainly the case here, as witnessed by the various fantasies involved in the construction of Maple Cottage as an "historic site." In the aftermath of the deconstruction of Maple Cottage as an historic site and Alexander Muir as a national hero, we are left with a number of pressing questions: What are the processes and mechanisms by which "The Maple Leaf for Ever" became one of the two most important national songs in late-nineteenth century Canada, which was already an ethnically and culturally diverse society? To what extent was Muir�s vision of Canada shaped by his ardent Presbyterianism and membership in the Orange Lodge, and how were he and "The Maple Leaf for Ever" received by those who did not share his ethnic and religious background? What were his views on the French fact in Canada, and why did he omit to mention this defining feature of the country in his song?13 Examining such issues has the potential to shed some much needed light on Alexander Muir and his national song "The Maple Leaf for Ever." 1. David Nickle, "�The Maple Leaf Forever� cottage to start new life," The Beach-Riverdale Mirror (Friday, October 25, 2002): 1. The first edition of Muir�s song, reproduced in Frederick A. Hall, ed. Canadian Musical Heritage, vol. 3: Songs I to English Texts (Ottawa: Canadian Musical Heritage Society, 1985): 82-84 uses the title "THE MAPLE LEAF FOR EVER" on the title page, but "the Maple Leaf forever" in the lyrics. Both variants are found in the various subsequent editions of the song. 2. John Ross Robertson in "Chapter 36: Arthur Muir�s life," Landmarks of Toronto, series 6 (Toronto: J.Ross Robertson, 1914): 496-586 provides detailed information about Muir�s places of residence from the time he arrived in Scarborough township (from his native Scotland) at the age of three up to his death in Toronto in 1906. It is clear from Robertson�s account that Muir never lived at 62 Laing Street, although he did live nearby in two different homes between 1863 and 1869. 3. See Ontario Conservation Review Board, "RE: City of Toronto � Intention to Designate 62 Laing Street (Maple Cottage)," p. 3-4 at http://www.culture.gov.on.ca/french/culdiv/heritage/crb/toronto_laing62.pdf (accessed 10 December 2002). See also Donn Downey, "The Maple Cottage forever? Historical board seeks to preserve house with shaky link to patriotic song," (Toronto) Globe and Mail (5 March 1991): A6. This article inspired two columns by Michael Valpy in the same newspaper on the song, "'Anthem' forgotten along with composer," (12 March 1991): A13 and "On odes, anthems, brass bells and fish," (29 March 1991): A7. 4. The principal owners over the years were Edward H. Roberts (to 1900), Lemuel Sharpe (to 1907), Lewis Geddes (to 1920), Thomas Southam and later his widow Fanny (to 1952), and Margaret Francis (to 1974). Southam Scientific Instruments occupied the building in 1988, but it was vacant by 1991, at which time it was owned by Conestoga Investments Limited and was the subject of the Ontario Conservation Review Board hearing (see n. 3). 5. Some of the information in this paragraph is from the web site www.maplecottage.ca (accessed 29 November 2002; no longer active as of 10 December 2002). 6. It is worth remarking here that the Orange Order was a dominant force culturally, politically, and institutionally in 19th-century Toronto. Between 1845 and the turn of the century, for instance, 20 of 23 Toronto mayors were Orangemen [source: Tony Ruprecht, Toronto�s Many Faces (Kingston: Quarry Press, 2001): 226]. 9. See, for instance, Canada First (accessed 10 December 2002), an anti-immigration web site which claims that "The Maple Leaf Forever" is "the anthem of the real Canada" and "proudly proclaims the real origins of this country." 12. See his "Nationalist histories and multiethnic classrooms," reprinted from Education Canada on the Historica web site here (accessed 10 December 2002) and "Why I killed Canadian history: conditions for an anti-racist history in Canada," Histoire sociale / Social History, vol. 33/no. 65 (May 2000): 79-103. The latter essay by Stanley is a reply to the nationalist historian J.L. Granatstein�s book Who Killed Canadian History? (Toronto: Harper Collins, 1998). 13. Faith Fenton in an interview with Muir for The Canadian Home Journal (1 February 1897) mentions that Muir visited Quebec for the first time in August 1896 and that he sang "The Maple Leaf for Ever" at Wolfe�s monument on the Plains of Abraham. She adds that "Mr. Muir is especially pleased with the knowledge that our French confreres have accepted the song, and that it has been translated into their language" (as quoted in Landmarks of Toronto). But Helmut Kallmann in "The Maple Leaf For Ever," Encyclopedia of Music in Canada, 2nd ed. (Toronto: University of Toronto Press, 1992): 802 states that "no French translation of the song has been located."